Rika Kihira of Japan performs her Free Skate at the 2018 Internationaux de France. 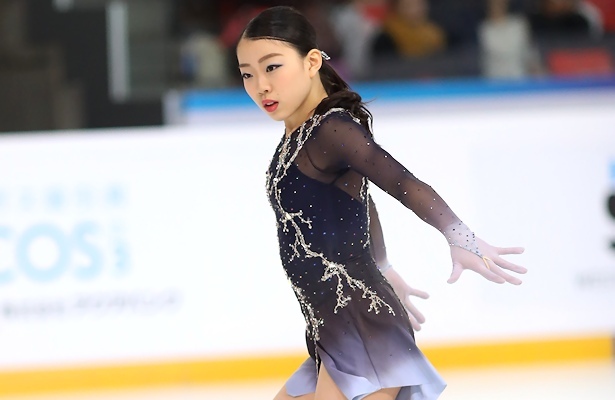 In her first season on the Grand Prix circuit, Japan’s Rika Kihira moved up from second to capture the gold (her second one, NHK Trophy) in the Ladies’ event at the 2018 Internationaux de France on Saturday evening. Teammate Mai Mihara took the silver while USA’s Bradie Tennell rose from sixth to secure the bronze. Kihira under-rotated a huge triple Axel in her ethereal routine to “Beautiful Storm” by Jennifer Thomas. The 16-year-old also under-rotated the back end of a triple Lutz-triple toe, but otherwise landed a total of six clean triple jumps, showing good spins and footwork throughout. She finished first in the free skate (138.38) and overall (205.92), signing her ticket to the Grand Prix Final. Mihara gave in inspiring performance to music from The Mission soundtrack in which the only mistakes were a under-rotated triple toe (in combination with a double Axel) and a doubled Salchow. The Four Continents silver medalist otherwise produced five clean triple jumps, showing good footwork throughout, and earned a level 4 on all spins. She finished third in the free skate (134.86) and second overall with 202.81 points, and is currently the first alternate going into the GPF. Tennell’s flowing routine to Romeo and Juliet by Prokofiev featured five triple jumps, however, the 20-year-old under-rotated the back end of a triple Lutz-triple loop and the front end of a triple flip-double toe-double loop. Despite the mistakes, she earned high grades of execution on her level 4 spins and footwork, finishing second in the free skate (136.44) and third overall (197.78). Stanislava Konstantinova of Russia rebounded with a good fourth-place free skate (134.76) which included seven triple jumps and two level 4 spins in her routine to music from the Anna Karenina soundtrack. The GP Helsinki silver medalist finished fifth overall (189.67) and is the second alternate moving into the GPF. Teammate Evgenia Medvedeva stumbled out of her opening double Axel and the back end of a triple flip-triple toe to finish fifth in the free skate (125.26) and fourth overall (192.81), taking her out of contention for a possible spot at the GPF (third alternate). Japan’s Marin Honda finished sixth overall (188.61), followed by Russia’s Maria Sotskova (177.59).